James Ray Tibbits was a pastor. He didn’t pastor a large congregation; he didn’t preach every Sunday, he didn’t have an office at a church somewhere. But that didn’t stop James from being the pastor God wanted him to be. He loved God’s word and was able, without any effort, to speak for as long as anyone would listen while bringing up perfect verses as illustrations from the Bible. 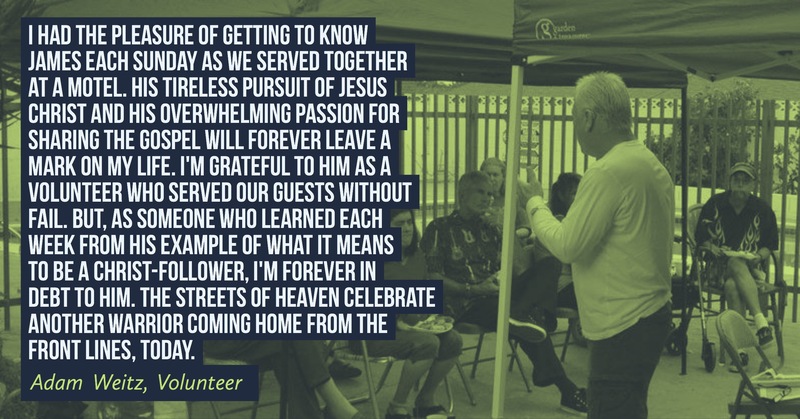 James was a key pastor at one of our growing MotelChurch locations. He arrived each Sunday filled with God’s spirit and ready to share the love of Jesus, which he so readily did. 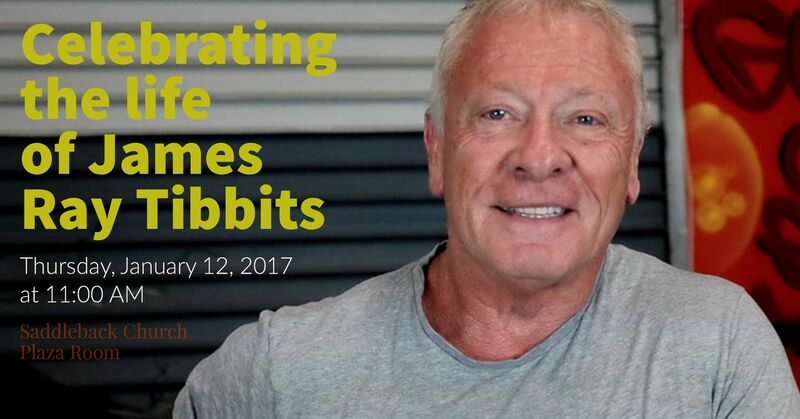 A fitness fanatic and kettlebell instructor, James gave so much of himself to help others with their health. And, he looked the part too. Strong, muscular build, ex-Marines like demeanor. He was a tough guy, from outward appearances but on the inside, he was very tender. Many times he and I sat together as he cried, genuinely over a relationship. He was that blend of tough and soft that makes a man genuine, honest, and authentic. He had many amazing qualities besides his knowledge of God’s word. Despite hearing issues, James adored talking with people. He loved sharing God’s word, and he genuinely focused on the person right in front of him, never looking past them to see something or somebody else. His skills were also many. When I first met him, it was his ability at drywall work that brought us together. We had wind and water damage to our roof and ceiling, and someone at church recommended him. His masterful abilities made it impossible to see where there had been any previous damage. But, we became close when he volunteered to speak at MotelChurch services. Within months he was a regular pastor, sharing a message every Sunday with folks living in the motel he served. The team of leaders and volunteers that served with him quickly developed an affection for this strong/soft man of God. 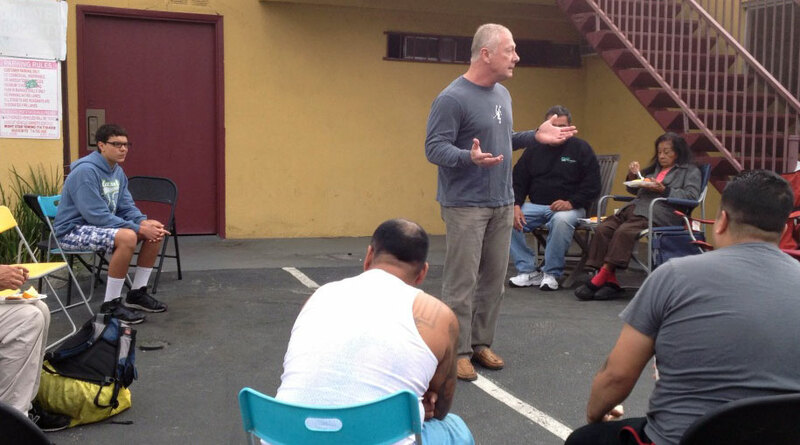 James speaking at a MotelChurch location in Anaheim. After taking a hiatus from MotelChurch, he sent me a text on Dec 11 saying that he would like to get back into preaching and serving after the first of the year. We all expect that he will, except now he’ll be serving from Heaven. On behalf of all the people you led to Christ, all the people you ministered to when they were hurting, all the people you impressed with your tender heart and command of the Bible – thank you, my friend. I’m sure you now have one of the bigger and more impressive mansions in Heaven. Learn more about the memorial service here.